Apparently, New Balance is considering re-launching its basketball category, and the shoe company may be focusing on the Celtics Gordon Hayward. Let me start by stating that I have nothing against New Balance, and I wore their shoes for many years. But I stopped wearing them, and there was a reason - a mighty narrow one, admittedly. Look at the next few old men (of which I am one) you see on the street or in the mall. Two out of three will be wearing white, low-cut New Balance sneakers that look 2-3 sizes too big. As I got older, that is why I stopped wearing them. I am getting older in years, but I refuse to give in. I went to Asics for that very reason. I looked at the comments to the tweet below, and most seem to agree with me. I refuse to let go of the minuscule remnant of youth that I still retain. Gordon had better think about this. Oh, and the 2-3 sizes too big comment - your feet flatten out and lose the arch as you age - resulting in a longer foot. None of it is pretty. 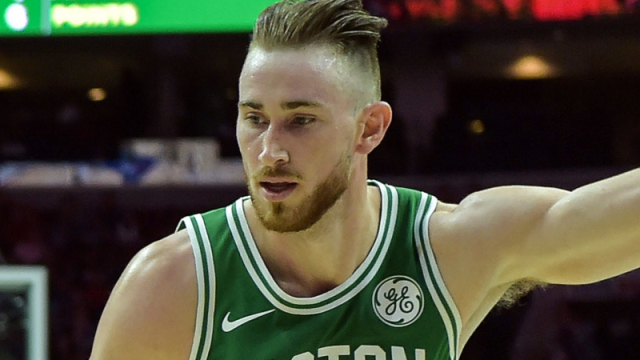 If Hayward cut the beard and got a real haircut he would like like a college kid. Why would he don old-man footwear and promote the brand. Besides, look at the next tweet. The retired White Mamba is already visually promoting the brand. Gonna have to wear sunglasses just to watch Celtic’s games with all that white. Gordon, listen to me. This is important. Next time you are in Walmart early in the morning and are slowed down by older folks moving at the pace of the Walking Dead, look at what the guys are wearing on their feet. You will see I'm right.